Blastrac exhibited at the EPF in Feuchtwangen in Germany. EPF is the leading trade fair for floor construction. It gathers all actors of the floor construction industry in Germany. For this exhibition, Blastrac exhibited for the first time with its new promotion trailer!! This Blastrac in house made promotion trailer is fully equipped with a kitchen, a terrace on the roof, 80 inch touch screen TV, four smart TV’s and a large show space for machines. The total length of the trailer is 13 meters long and when open 5.5 meters wide. Thursday the 26th of June was the opening day of the exhibition and at 6pm there was the world cup game between Germany and USA. Together with over more than 150 customers, visitors and other exhibitors we watched the game on the 80 inch screen which is attached on the side of the trailer. In total Blastrac participates at more than 40 exhibitions a year and we are going to use this promotion trailer on most of these events! 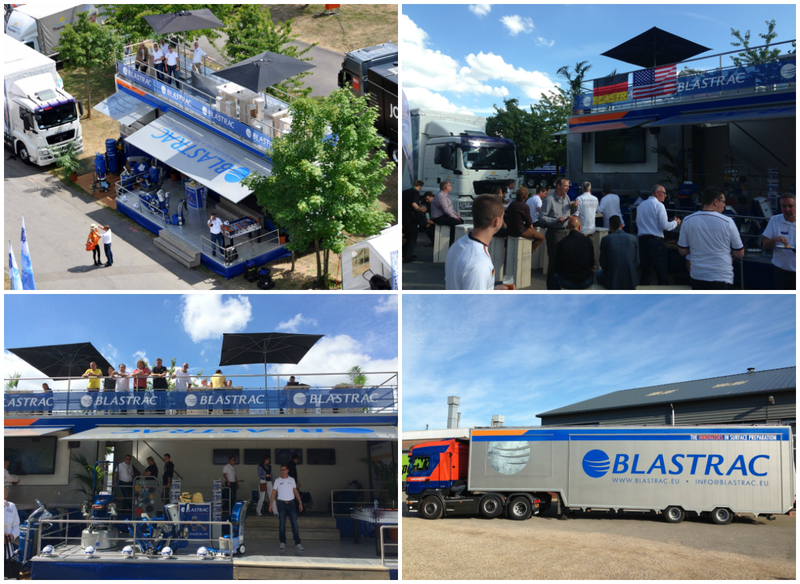 Blastrac would like to thank all their partners who have worked together with us on building this great promotion trailer! We are very happy to present to you this new promotion trailer and we look forward to welcoming you on board.